Think back to when you were in school—how often did you connect what was happening in the classroom to the real world of work? If your answer is “not much,” you are not alone. For the 20 students from Ms. Dara Rosen’s biomedical class at Mission Vista High School in Oceanside, a day at Vertex Pharmaceuticals—a global biotechnology company—was designed to change that outlook. 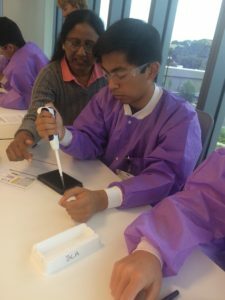 Upon arriving at Vertex Pharmaceuticals’ new office, students were led to its STEM Learning Lab to see exactly what employees do. This Learning Lab was created specifically with the community in mind, providing a space where students interested in STEM can explore and discover. In the Learning Lab, students heard about Vertex’s investment in scientific innovation to create transformative medicines for people with serious and life-threatening diseases. In fact, it was Vertex that discovered and developed the first medicines to treat the underlying cause of cystic fibrosis—a life-threatening genetic disorder. Currently, Vertex has more than a dozen ongoing research programs focused on the underlying mechanisms of other serious diseases. 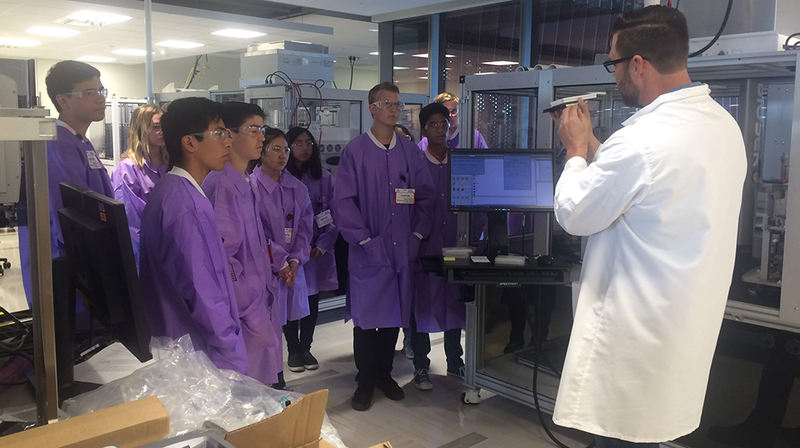 Students then suited up with lab coats and protective eyeglasses for a tour of the facility, including the chemistry and sonar labs. Staff were stationed at each lab to give insight into their daily work and field as many questions as the students’ curiosity could conjure. Putting their biotech skills in action, the students then participated in small group experiments. Vertex staff set the stage by explaining that antibiotics work by inhibiting the cell wall synthesis of bacteria, which therefore stop multiplying and are cleared from the patient tissues. Bacteria, however, have evolved defense mechanisms against these antibiotics. The students tested an array of substances to discover a few that defeat the defense mechanism of the bacteria and determine which of those are the most potent. This requires adding the bacterial defense protein (an enzyme) and a color-changing reagent (substrate) to a plate of compounds to find agents that inhibit the color change by inhibiting or destroying the defense protein. Using a plate reader to quantify the signal allowed them to graph the results to determine the potency of the compounds. This experiment called on students to use equipment they were familiar with from class and get an introduction to new equipment. For example, they had never seen how a plate reader inserted into a specialized machine can tabulate data to show up on the screen in the form of a graph. The process executed in the experiment is similar to what the industry uses to uncover starting points for drug discovery—the start of a journey that can take up to 10 years before a medication finds its way to patients. Deemed by students as the “best trip ever,” what makes the experience so valuable is the opportunity to bridge the gap between classroom lessons to career exposure and real-life scenarios. 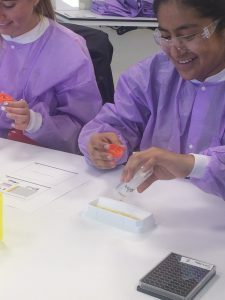 “In class we have studied how bacteria develop antibiotic resistance and how antibiotics work, but at Vertex we learned specifically that bacteria have enzymes that break down B-lactam antibiotics,” one student noted. “The hands-on lab experience was an opportunity to extend on concepts learned in the classroom and provide relevance and real-world experience,” said Ms. Rosen. This can often be a missed opportunity for high schoolers and why so many of them complain that they do not think they will use a lot of what is taught in the classroom once they have graduated.